If you’ve spent some time with Lab Management, specifically where you’ve leveraged Network Isolation you will have noticed the nice fully qualified domain names assigned to the external network adapter identified in the diagram below as “Computer name:”. 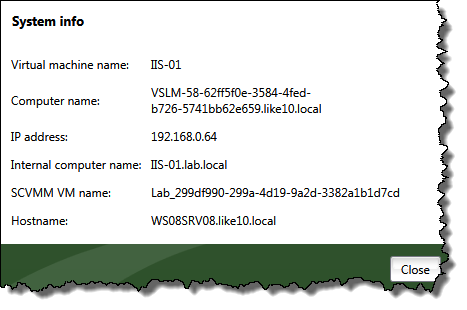 If you want to create easier to remember names for your VMs you could create some CNAMEs in your DNS so you can have a name like iis-01.dev.lab.tfs.domain.local instead of VSLM-58-62ff5f0e-3584-4fed-b726-5741bb62e659.domain.local of course this is quite a bit of effort if you have many environments and machines or recreate your environment. In my DNS Manager I have created a few subdomains as containers for virtual machine friendly names in Lab Management Environments. Now that I have those subdomains I just need a really easy method to create CNAMEs based on the computers in my environments so I can get entries like these created for me. I created a Powershell Script to iterate through a Lab Environment for a Team Project. 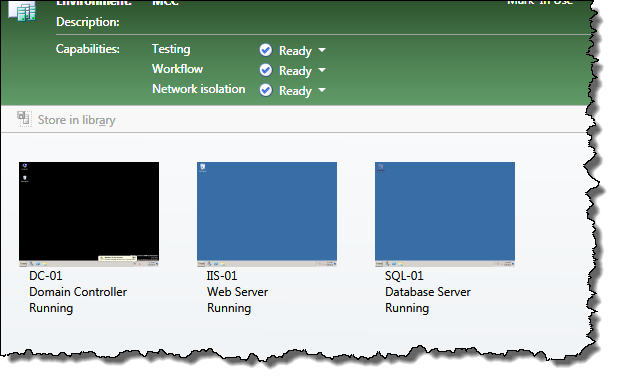 In Lab Center I have enabled the display of the ID column for the Environments which I will use later in the Lab URI. Here is the Powershell script, use at your own risk. Let me know if you find it useful. The script ignores the machine configured as the Domain Controller in the environment as it has no external adapter defined. The script gets the internal computer name to use as the friendly name. $server = $dnsServer -split "\." $text = "$alias IN CNAME $labComputer"
Write-Host " CreateCnamesForLabEnvironment.ps1 [-dns ] [-flzone ] [-aSuffix ] [-labUri ]"
Write-Host "-dnsServer : DNS Server : dc01.domain.local"
Write-Host "-flzone : Forward Lookup Zone : domain.local"
Write-Host "-aSuffix : alias suffix : dev01.tfs.domain.local"
Write-Host "-labUri : URI for Lab Environment : vstfs:///LabManagement/LabEnvironment/470"
Write-Host "-tpcUrl : URL for Team Project Collection : http://localhost/tfs/DefaultCollection"
Throw "DNS server not found"
$svr = $internalComputerName -split "\." Write-Host "The Lab Environment specified is not running!"